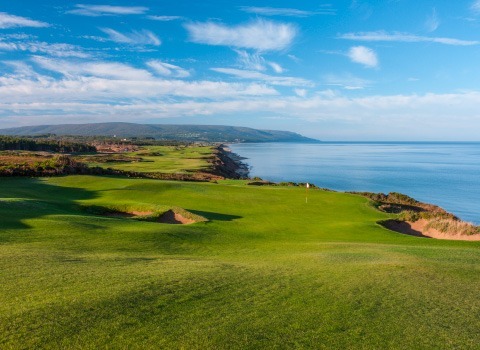 Exquisitely carved out of the breathtaking Cape Breton landscape, with postcard worthy panoramas vying for your attention and rich, rolling fairways waiting to reward your creativity, this is linksland golf at its best. Built by dreamers, for dreamers. Canadian Golf Hall of Fame member Lorne Rubenstein is the author of 13 books on golf. Certain courses stir the imagination and fire the mind, even during construction. 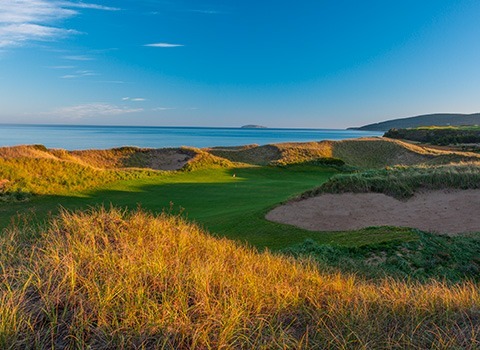 I had those feelings when Ben Cowan-Dewar, the managing partner at Cabot Links, first drove me over to where the resort’s second course, Cabot Cliffs, was taking shape. This was in May 2013. 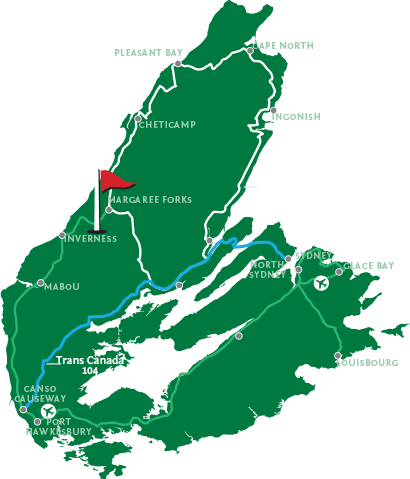 As Ben conveyed us along a construction road, the outlines of the course perched high on a cliff overlooking the Gulf of St. Lawrence’s Northumberland Strait were revealed. The ingenuity of designers Bill Coore and Ben Crenshaw was immediately evident. We got out of the truck in places to walk. Ben pointed to stakes where tees, greens, and fairways would take shape. We made our way to the dramatic site for the par-3 16th hole that plays across a chasm with the sea such a strong presence, and puts one in mind of the famous 16th hole at Cypress Point Club on the Monterey Peninsula in northern California. Yet it was also clear to me that Cliffs, as it was already being called (the memorable courses are often attached to one word—Augusta, Cypress, Pebble, for example) was going to be much more than just the glamorous, eye-popping 16th hole. Fairways would surge along ground near the cliff’s edge, and also appear inland, away from the ocean. I was viewing a course that would be part links, playing over and around dunes, and part parkland, playing through forest. The first hole, a par 5, would sweep along a vast fairway—width would be important at Cliffs, thereby offering options for play. The course would turn inland at the third hole, and wind its way back to the cliffs. I continued to visit the property as the course took shape, and played it for the first time in mid-August 2015, when director of golf Joe Robinson joined me and my fellow journalist and friend Jeff Brooke of The Globe and Mail. 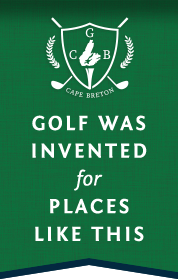 Rod Whit-man, who had designed Cabot Links, was so taken with the property and the project that he worked as a shaper on Cliffs. Joe pointed out that the fairway on the par-5 10th hole was once “pancake flat,” but that Whitman, who craves being on a bulldozer and moving earth, had created a fairway full of contour—ripples, humps, bumps, knobs. “We call this Whitville,” Joe said. I studied the holes as I played. How would I next play the par-4 second hole, with its enormous sand dune short of the green? What spot on the fairway would provide me the most favourable angle into the green? Cliffs posed questions, and offered solutions via options for shots. And the views were exhilarating. There is that word again. I’d now seen Cliffs from raw ground to completion. I was already anticipating my next visit to the course that made its debut on Golf Digest’s January 2016 ranking of the top 100 courses in the world at number 19—astonishing to be ranked so high so fast. It’s one thing to play a course for the first time. It’s another to want to return, again and again and again. Upon leaving Cliffs, I knew I would want to return, and often. What a feat of imagination. What a setting. What a course.